The narrowing of the canal which your spinal nerves travel is defined as Spinal Stenosis. There are typically two causes of Spinal Stenosis: Disc Herniation, caused when the herniated disc matter is squeezed into the spinal canal, resulting in narrowing of the space, and sometime impinging the spinal nerves. When this happens, many symptoms can occur, including numbness and tingling in the legs or feet, back and leg pain, as well as weakness. 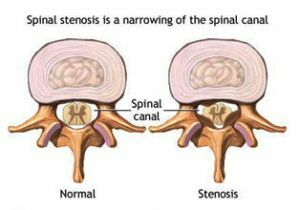 Another cause of Spinal Stenosis can be bone spurs (arthritis) growing into the canal that close down on the normal space, and often times compress the spinal nerves. Contact our office at (01)642-5911 to schedule an initial consultation to determine if your clinical case is suitable for the spinal decompression therapy. You may also bring recent copies of x-rays or MRI films or reports to help evaluate your case. After answering any questions you may have about the recommended plan, you may begin your case.